NOODLES workshop at the Faculty of agronomy and environmental sciences, Evangelical University of Bandjoun, Cameroon. On Wednesday 23rd 2018, NOODLES held his third workshop series at the faculty of agronomy and environmental sciences; Evangelical University of Cameroon (UEC). UEC is a private and confessional University based in the beautiful town of Bandjoun in the west region. The region is known to be one of major food basket of the country. UEC is under the tutorship of the University of Dschang. Base on the fruitful discussion we had one on January 17th at the university of Dschang, some of the staff also lecturing at UEC intervene to present some challenges they are having for the training of students and the needs for supports in capacity building, sensitization, coaching and mentoring of students who most often work on the field with small producers. It happens that UEC is willing to establish a laboratory for foods analysis as well quality controls programs and is willing to reinforce its capacities to meet the current needs and challenges of the local and international markets. During the launching of NOODLES project for 2017/2018 (photos/videos concours, geophagy project), letters were sent to that university for involvement but no response was received. 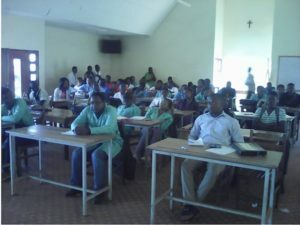 During the seminar in Dschang, member of the staff expressed their interest to have their students informed and involved in such ongoing projects. One week later, we were able to make the dream come true. The workshop was animated conjointly with Professor Colizzi (Dean of the faculty of science and technology). During the session, the organization of a food control system at national and council level was discussed, as well as the role of a laboratory for chemical analyses. Quality control, certification and accreditation for laboratory were discussed with reference to existing standards.